Hey there! Welcome to 2014!!! Wishing you all the best, health, love, prosperity and delicious food – always. This recipe is so easy to make, but nobody will believe it. I served these babies on New Year’s day and my family loved them! I was inspired by a very popular treat native to Sicily, my father’s homeland. It is a brioche bun about the size of a hamburger bun served with granita. Granita is like ice cream but does not contain any milk. The most common type granita found here is the lemon flavoured one but it comes in a variety of flavours including pistachio, almond, strawberry and more. This combination is commonly enjoyed for breakfast. Italians love a cookie or sweet bread with a coffee for breakfast rather than the heavier North American or UK breakfasts. 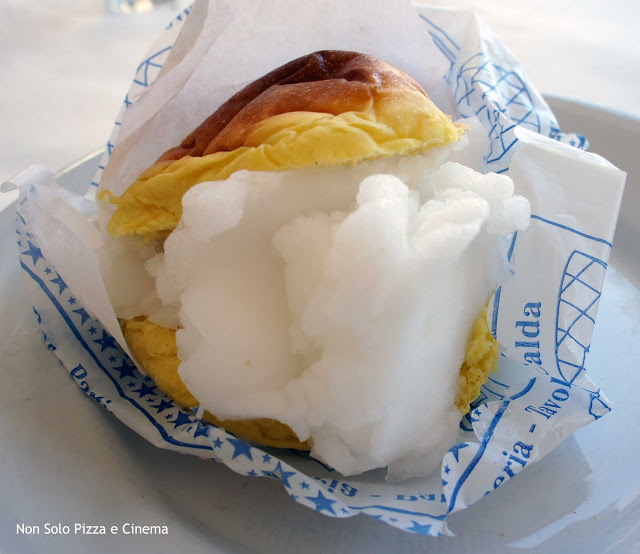 As shown below, the granita is either served on the side or inside the brioche, like a slider. It’s not something that’s commonly found in North America. Even having grown up with my Nonna Stella, my Sicilian grandmother, we never ate this at home. So if you want to impress your guests and offer up something totally different in the process, I think this is the way to go. In my take on this Sicilian speciality, the buns are mini, I have them for dessert and fill them with my own, espresso ice cream (recipe follows). 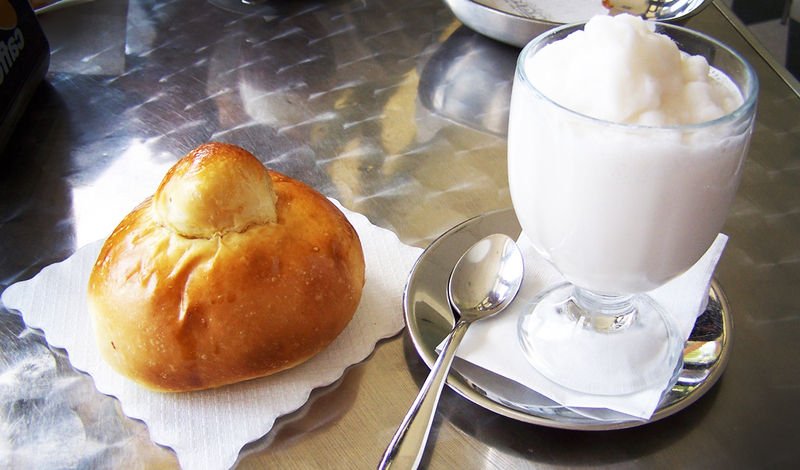 To serve, I make a deep incision in the center of the brioche and spoon in an nice generous amount of ice cream. I do this just before serving. I do not recommend pre-filling them and storing in the freezer. 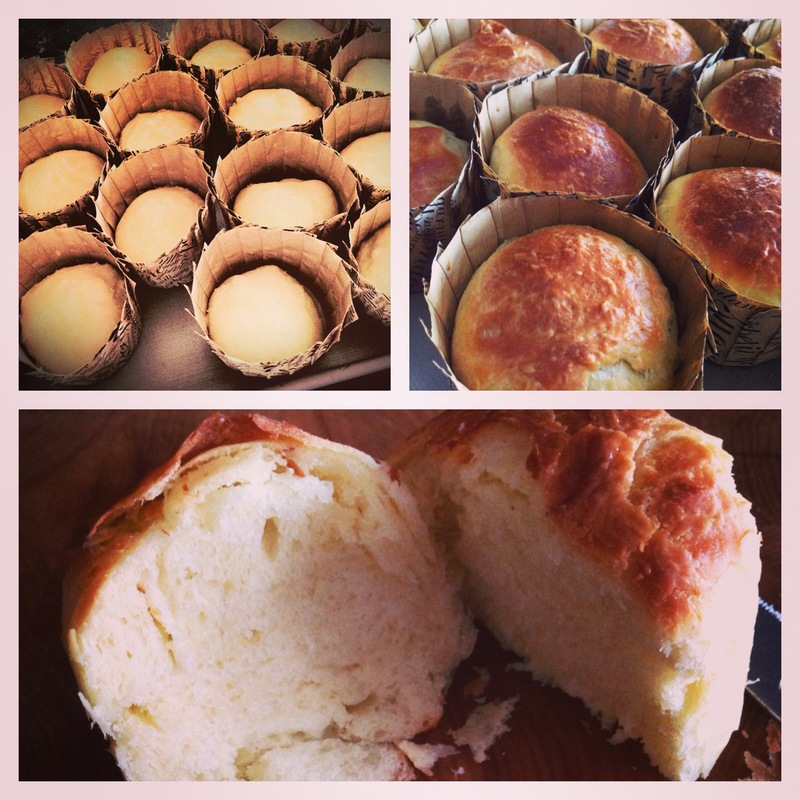 I like my brioche to be at room temperature so that I can fully enjoy its buttery, soft texture and flavor. People can either pick it up and eat it with their hands or cut into it with a fork so its perfect for any type of party you are having – casual or not so casual. Heart to Heart – Yes, you can buy brioche buns and yes, you can buy ice cream but that would just take away the whole beauty of the experience. 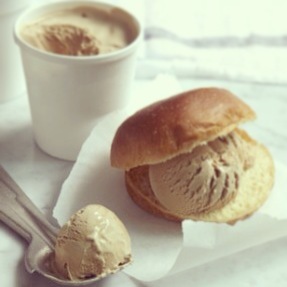 Anybody can “shciaf” some ice-cream into a bun! However not many can say “I made the brioches AND the ice cream myself” and the best part is that only you will know it was so easy. It gives you a sense of pride and people will love & appreciate it all the more if they know you made it. Technical – The brioche recipe instructions are based on the use of a standing mixer however mine is not working properly so I was stuck doing it by hand. I was sure it would be a flop but decided to try anyway. To my surprise, the dough turned out great and it really wasn’t difficult. Planning – The ice cream must set in the freezer for a minimum of 6 hours and the brioche dough must be refrigerated overnight so it’s a “plan ahead” type of thing. -paper liners as shown below are pretty and hassle free (found at Ares). No need to grease the tin or wash afterwards 😉 Place them on a cookie sheet and bake! Additional: A food scale helps, otherwise make the dough balls a little bigger than a munchkin/timbit. Mix with your hands and allow to stand for 5 minutes until the yeast and sugar dissolve. Add the eggs and beat on medium speed for 1 minute, until well mixed. With the mixer on low speed, add 2 cups of the flour and the salt and mix for 5 minutes. With the mixer still on low, add 2 1/4 more cups of flour and mix for 5 more minutes. Scrape the dough into a large buttered bowl and cover with plastic wrap. The next day, allow the dough to sit at room temperature for 1 hour. Meanwhile, grease 20 mini brioche tins, if using. Set aside. Place the dough in the bowl of an electric mixer fitted with the dough hook, add the softened butter in chunks, and mix for 2 minutes, adding additional flour as needed to make a ball. Turn the dough onto a lightly floured surface and divide the dough into 20 (1 3/4-ounce) balls and place them in the tins. Cover the tins with a damp towel and set aside to rise at room temperature until doubled in volume, about 2 hours. When the 2hr rising time is up, brush the top of each with the egg wash and bake for 20 minutes, or until the tops spring back and it sounds slightly hollow when tapped. Turn the rolls out onto a wire rack to cool. Whip/whisk all the ingredients together until soft peaks form, and you have a gorgeous, caffe-latte-coloured airy mixture, and then fill a 2 cup / 1-pint airtight container, and freeze for 6 hours or overnight. Serve straight from the freezer. 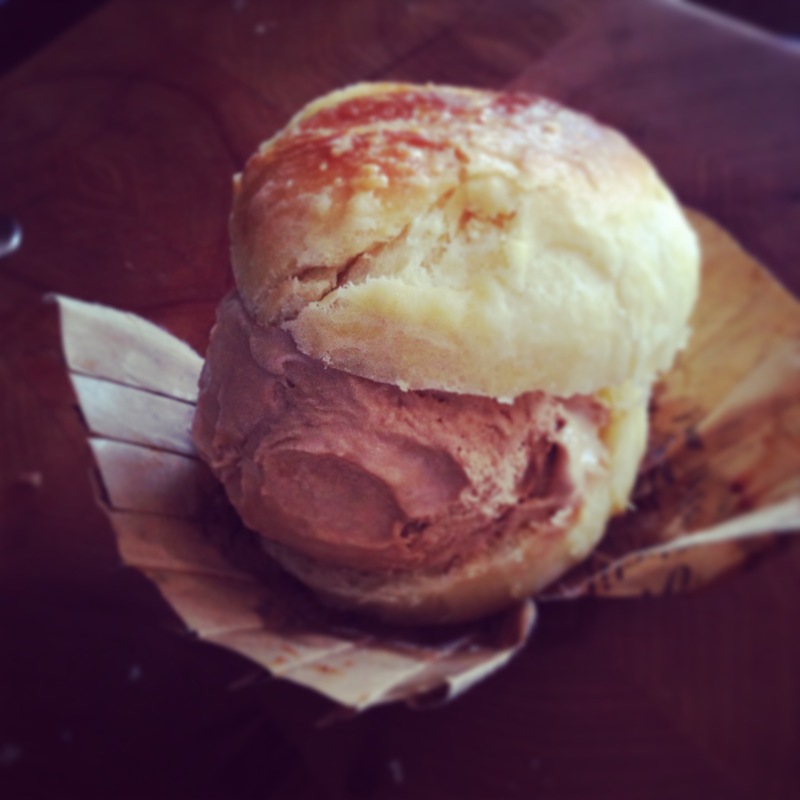 Actually, now that I’m writing about this….got me thinkin’ ….I froze some brioche buns and have a little ice cream left. I may just warm up a bun and have one of these little desserts right now!